Piragua 1, 28042 Madrid, Spanje. 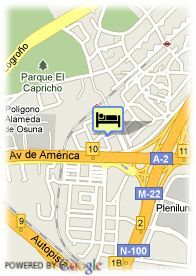 The Maydrit Hotel is a newly built establishment located in Alameda de Osuna, one of the best areas from Madrid. This hotel with actual design is located close to the Madrid Trade Fair. Ideal for the business people and for the tourists as well, this hotel disposes of 112 full rooms, carefully decorated and with up-to-date equipment. 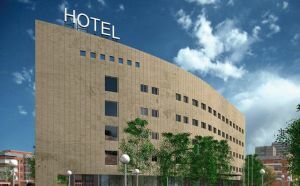 The Maydrit Hotel offers a complete Business Center with halls ready to hold events, reunions and conventions for until 180 people and perfect for the business trips. Furthermore, it dispose of relaxing outdoor gardens. Very well connected by road and public transport, this hotel is the perfect starting point in order to easily arrive at any corner from Madrid. Betalende overdekte parking aan het hotel (16.00 €).